The most beautiful road in Morocco. Enjoy the hospitality of the Berbers in the region and learn about their culture. Admirethe beautiful landscapes that will provide a stunning backdrop to your journeybetween the oasis palm grove is the dunes from the village of Agdz: The palm grovesand cultivated fields s’étendrent seem to infinity, bordered by beautiful villages andKasbah adobe. These houses made of mud, straw and water are placed high on thenon-fertile land overlooking the palm grove. Arrival at the airport and transfer to the hotel. Dinner and overnight at the host 3 *** Marrakech. Breakfast and transfer by vehicle to Nesrate via Ouarzazate and Zagora along the Draa Valley. Arrive Nesrate and meet your camel team. A walk to our first bivouac in Ait Zemraou. 1:30 walk. Dinner and overnight in tents. Breakfast and continue the trek under the bright sun of the South through desert landscapes and lush palm groves, rocky plateau and meeting with the villagers. 5 hours of walking. Dinner and bivouac in the middle of dune. 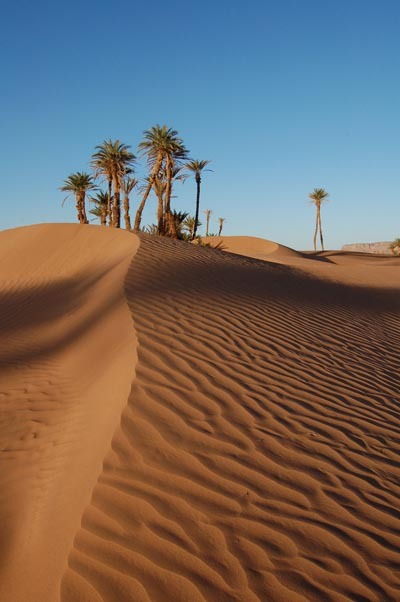 The caravan continues to drill its way to the South as in past eras, nomadic villages, nomadic culture and beautiful landscapes of the desert oasis and palm grove. Arrival in the palm of Tiraf. Continuation of the caravan for the beautiful dunes Tidra. On this day, we follow the left bank of the Oued Draa, whose landscape is desert: no palm trees, but only dunes and tamarisk. It is a great step, especially for those who appreciate the emptiness and silence. In the afternoon we cross the village and the oasis of Ergabi to reach the village of Oulad Adriss. Early morning departure back to Marrakech (450 km) by road Draa and neck Tizi’n Tichka. Along the way, we will make some photo stops. Arrive at your hotel in Marrakech. Dinner and overnight at the host 3 *** Marrakech. – Transfer arrival and departure from the airport to hote Marrakech. – 02 nights half board at the hotel in Marrakech 3 ***. – 05 nights in tents during the trek. Depending on demand and are secured to the base 1 participant. The price is studied at the fair, they vary according to the following criteria: (low or high season, the scheduled visits, transportation, length of stay, number of participants). September, October, November and March, the day between 20 ° and 28 ° and at night between 10 ° and 15 °. December, January and February, the day between 17 ° and 22 ° and at night between 5° and 9°. April and May: the day between 30 ° and 37 ° and at night between 13 ° and 18 °. Easy hikes, accessible to anyone of normal fitness (children over 5 years), able to walk 4-6 hours daily on varied terrain. It is expected a camel for two to carry food and baggage of the group. For a guide assisted by a French Moroccan cook and camel drivers. Limit the weight of your luggage, your travel bag must contain all of your business. Instead, take a soft travel bag with side openings or backpack without a frame, avoid rigid bags and suitcases. – 01 sleeping bag (warm winter). – 01 small backpack for the day. – 01 pair of walking shoes light into the ankle (sneakers). – 01 pair of shoes and a pair of sandals. – 01 loose trousers for walking. – 01 sweater or fleece (October to March) and another to put lighter underneath. – 01 flashlight + spare battery. – 01 flask (1.5 l). – Sunglasses, hat and sunscreen. – Toilet paper and a lighter. – Toiletries and toilet wipes (woman). – 01 small pharmacy and your regular medications. It is customary to tip the team who accompanied you during your stay. Depending on the satisfaction that you withdraw from the team, it is reasonable to tip minimum of 15 € per hiker. This amount is collected in several envelopes that you forgive, the guide, the cook and camel drivers and drivers with the type of stay, when to leave. It is generally customary to tip most important guide and the cook and then to the camel.